Action from Blackstones' FA vase win over Peterborough Northern Star. Photo: David Lowndes. Blackstones and Wisbech Town have both been handed home draws in the first round of the FA Vase. United Counties Division One side Blackstones, who knocked Premier Division Peterborough Northern Star out on Saturday (October 3), will host Shrewsbury-based Haughmond who are currently second in the West Midlands Football League. Wisbech will entertain Alvechurch of the Midland Football League Premier Division. They are currently fourth. Both ties will take place on Saturday. October 31. Blackstones have a big game on Wednesday (October 7) as United Counties Division One title favourites Peterborough Sports visit their Lincoln Road, Stamford base. Sports have won all seven of their league games so far, including a 2-1 home win over Stones, and will go top with three points. Northern Star can lick their Vase wounds by winning a Premier Division game at Eynesbury tomorrow. Also tomorrow Yaxley host Holbeach United and Wisbech entertain rock-bottom Huntingdon Town. 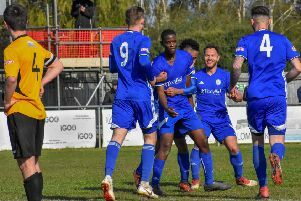 Deeping Rangers, who bowed out of the FA Vase to a 120th-minute goal at Great Yarmouth on Saturday, are in United Counties League Cup action at Premier Division rivals Desborough. Eynesbury v Peterborough Northern Star. Wisbech Town v Huntingdon Town.